Seattle Web Cams - Get a taste of your next vacation before you arrive! An early glimpse into your next vacation! 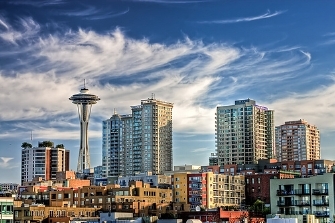 Seattle web cams can be one of the best ways to get a feel for what to expect in Seattle before you ever step foot off the plane. Whenever we go somewhere on vacation, one of the first things we do is check out as many videos online of the place where we're going. This not only helps give us a feel of some of the things we can look forward to, but it is a great way to give the kids a small taste of where we're going and what they can expect. As many videos as there are online either on YouTube or some of these other video-sharing sites, one thing you won't want to miss is checking out some of the various web cams in Seattle. Here are a couple Seattle web cams that I've run across online. While they aren't the most exciting things to watch 24 hours a day, they can provide you a small taste of what to expect (at least weather-wise) for your trip to Seattle. This is a webcam mounted on top of Marqueen Hotel which points towards the Space Needle. If you watch it long enough, you'll be able to see planes flying by the Space Needle as well as the elevator on the Space Needle moving up and down. The web cam even has an option for seeing a time-lapse view or an archive view of the Space Needle, which is somewhat interesting to watch. Pretty straightforward, this is a webcam on top of the Space Needle. It points in all directions and you can see various landscapes that are marked out on the webcam, which is kind of cool. It also has time-lapse viewing options similar to the Marqueen Hotel cam. So obviously this isn't located in downtown Seattle, but it's a pretty nice view regardless. This is a webcam run independently outside someone's house (I think) in Silverdale, which is about 20 miles west of Seattle. The webcam shows a really nice shot of Hood Canal towards the Olympic Mountains. Hopefully at least one of these will peak your curiosity and give you a little taste of what you might be able to see on your next trip to Seattle. Return from Seattle Web Cams back to Seattle Tourist. Know about any other Seattle web cams?